Each project group should plan for a 20-minute presentation, but there is enough slack for 30 minutes if necessary. This Thursday, April 28, I'll ask for working titles and group members for the final projects, along with everyone's free times during finals week (May 9-13), so that we can schedule the project presentations. Also, at the end of Thursday's class, I'll distribute ICES forms. One-line summaries of the submitted project proposals are now available. I will describe the proposals in detail in class tomorrow. At least one student has asked me not to post their proposal on the web site; to respect this request, I will not post any proposals until next week. If you do not want me to post your proposal, please let me know by April 15. Alternately, if you send me a revision of your proposal this week, I will post that instead. Project proposals are due Friday, April 8. This is a hard deadline! The project reports will be due Friday, May 13 (the day our final exam would be held if we had one). If you haven't already submitted Homework 1, please do that soon, so you don't have to work on homework and your project at the same time. LaTeX source for Homework 1 is available. A few people have asked for lecture notes; unfortunately, I just don't have time to write up lecture notes this semester. Erik Demaine and his students have written notes for almost all the topics I've covered so far, for a similar class at MIT. Homework 1 is due Thursday, March 3. Ish. Class is canceled next Tuesday, January 23; Jeff will be at SODA. I incorrectly listed the class time as 11:00–12:15 on the posters advertising the class. The class actually meets 12:30–1:45. Sorry about the screwup. Enjoy an early lunch tomorrow! Students in all areas of computer science and related disciplines are welcome, including algorithmically mature undergraduates. 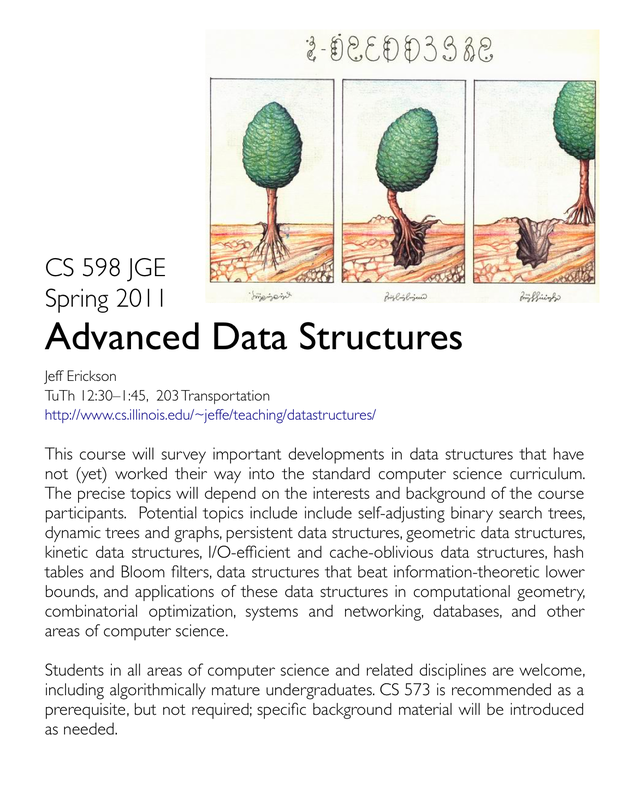 CS 573 is recommended as a prerequisite, but not required; specific background material will be introduced as needed.